The Hutchinson Community College women’s basketball team’s streak of having an NJCAA All-American reached five straight seasons. 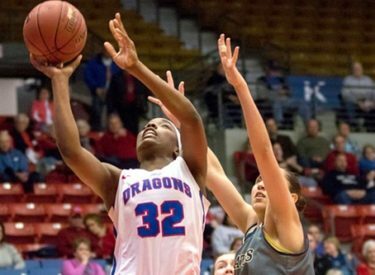 Sophomore forward Jada Mickens became the 13 Blue Dragon women’s basketball player to earn All-America honors after being named on the honorable mention list to the 2018 NJCAA Division I Teams released on Wednesday. The 6-foot freshman from Liberal was Hutchinson’s top scorer in a 27-7 season that saw the Blue Dragons tie for second in the Jayhawk Conference, advance to the Region VI Tournament semifinals and earn an at-large bid to the NJCAA Women’s National Tournament in Lubbock, Texas. Mickens is only the fourth Blue Dragon freshman to earn All-America honors. Heather Robben (2009) was an honorable mention selection, Jackie Patterson (2011) was a second-team selection and Kalani Purcell (2014) was chosen as an honorable mention pick. Mickens averaged 13.5 points per game while shooting 50.1 percent from the field. She added 18 3-pointers, shooting 31.0 percent from distance. Mickens also shot 73.1 percent from the free-throw line as well as averaging 8.7 rebounds, 1.3 assists, 1.4 steals and 1.2 blocked shots per game. Mickens ranked ninth in the Jayhawk Conference this season in scoring , fourth in field-goal percentage, eighth in free-throw percentage, sixth in rebound average and fifth in blocked shots. Her 458 total points were ninth most scored by a Blue Dragon freshman. Her 114 total free throws were fourth most by a Blue Dragon freshman. Her 295 rebounds and 8.7 rebounding average were fifth and eighth, respectively by a Hutch freshman and her 40 blocked shots ranked third in Blue Dragon freshman history. Mickens started her Blue Dragon career with a 34-point, 10-rebound performance. She finished the season with 13 double-doubles. All 13 Blue Dragons who have earned All-America status have come in the John Ontjes-era. Mickens was one of three Jayhawk Conference players to be named to the 2018 All-America team. Seward County’s Mollie Mounsey was a first-team selection and Erika Mattingly of Butler was named to the third team.